My friends, Charlie Pate and Sunni Almond from Wishes for Children, posted on their personal Facebook pages about a grand opening of a new restaurant in Temecula. (Grand opening was July 11th). When I looked them up, I was pleased to see a restaurant whose main focus was on sustainable foods. Bushfire Grill has a simple menu that offers something for everyone! Do you believe it? See for yourself! Imagine a place that features hormone-free, free-range beef (Prime Natural Angus) & chicken and mostly organic produce but always local, and their own organic focaccia bread baked daily that is conveniently located next to Trader Joe's! Best of all - at affordable prices! Can you believe that? I have been to the place twice and hope to make it a third time within a week's time. Yeah, I'm hooked! The first time I went I ordered the Veggie Delight and the next day (yes, I said the next day! ), I ordered the Veggie Bowl. My friend on day 1 ordered their seasonal veggies prepared to her liking. Yes, they do this, too! Grilled with a little sea salt only. Tossed in-season veggies with Basmati rice. I spoke with one of the head chefs, Ryan, on the first day and then I had the privilege of meeting and speaking to one of the owners, Brandon Barwin, on my second visit. The girls, Taylor and Adriana, were hospitable and had friendly, inviting smiles. Everyone was eager to serve. I was given a sample of their focaccia bread with the 'dipping' sauce made from scallions, garlic, vinegar and a couple other things -- let's just say, I ordered it on day 2. Ryan was telling me about the hopes of Bushfire expanding into San Diego and Orange counties sometime down the road. I chatted with Brandon about how they plan to showcase their fresh salads. I liked his idea of allowing customers to customize their own by displaying each ingredient in their own bowl. This way Bushfire can feature at all times, in-season produce, and the options will always be fresh. I shared with both of them that their restaurant is needed in our community due to the many people who understand the philosophy of the numerous health benefits of consuming only hormone/antibiotic free meat, or if vegetarian - eating organic produce, and it also touches the community who desires to support the local farmer! I trust that Bushfire Grill can expand into other areas in Southern California. Brandon is the owner of Melt Gelato in Boston. Melt has several locations in the U.S. They have awesome fruit infused water to drink free with any order. Be sure to check out the fruit selections at each visit. I enjoyed the orange-cucumber infused water! Now Expired: I mentioned Wishes for Children in this post because Bushfire Grill is running a promotion through July 24, 2012: "Celebrate our opening with a FREE entrée of our free range chicken and french fries, by making a minimum $1 donation to our Wishes for Children foundation." If you don't have the card in hand when donating to Wishes for Children, you may tell them that you heard about it through the Conveying Awareness blog. Location: 40665 Winchester Rd., Temecula, CA 92591. Hours: Mon-Thurs 11:00 a.m. - 8:00 p.m., Fri/Sat: 11:00 a.m. - 9:00 p.m., and Sun: Noon to 7:00 p.m. In a hurry? You can place your order directly on their Facebook page! If you know me, I love to plug local businesses that are capturing the essence of wellness. I believe that you'll visit this place and walk away pleasantly surprised about the quality and amount of food you'll get for the price. Be sure to tell them Conveying Awareness sent you! Bushfire Grill is on Facebook: www.facebook.com/BushfireGrill. Wishes for Children, a non-profit benefiting terminally ill children right in the Temecula Valley, on Facebook: https://www.facebook.com/pages/Wishes-For-Children-Temecula-Valley/58651756971. My son and I spent the morning at two great places on Independence Day. The first stop I'll share on this post, which was our visit to the Temecula Berry Co. The second stop I will share my own experience at one of "Temecula's hidden treasures." My friend posted her article to my blog that published on July 4th on this treasure: Buena Loma Gardens. The weather could not be any better! I think it was in the low 80s. That's pretty unheard of in this area at this time of the year. I have to admit I hadn't been to the farm this season at all until I realized that their season was ending within a few days. Blueberry season is short - early May through early July. The Temecula Berry Co. family is lovely and they do a lot of community events at their farm like movie night on Friday evenings and reading books to small children in the mornings twice a week. In an unfortunate accident right before the start of their blueberry season, Farmer Mike lost his wife in a tragic tractor accident. It brought a lot of grief but the local community really reached out to them in their time of need. They felt the love and support of their neighbors. When my son and I decided to go to the farm on July 4th we had learned that one of their good friends had just lost his wife. All the proceeds of the day's sales would benefit this family. I love the way people open their hearts and help one another - that's the definition of a true community. Since this was our first time visiting the farm this season, we saw that they had added a chicken coop and even had more areas with shade to sit in and retreat from the sun. Farmer Mike's dad, Ray, puts on a show at 3p daily for the kids to learn more about the hens. They lay a lot of eggs but they do not sell them to the public. Perhaps this will be something they will do next year?! My son and I had a blast picking the blueberries and since it was the end of the season, they weren't hard to find! There was an abundance of blueberries. We ended up with a pint and a half. The pints sell for $5 each. My son ate the 1/2 pint within 10 minutes of leaving the farm. I plan to make blueberry pancakes with the fresh berries. The one lane road getting in (or leaving). Very steep! Turns into two lanes. See the farm down below? My son picking berries for us to enjoy later. The chicken coop is in the red barn behind my son. This week is Support Small (& Local) Businesses Week (July 1-7) and I have a special place to share with you by way of my friend who visited Buena Loma Gardens for the first time just a couple weeks ago. She has given me permission to share her story with you. About 2 weeks ago I packed up the kids for a hike to the Santa Margarita Trail in Fallbrook, Ca. I had a general idea of where I was going but was relying on my cell phone for directions. As luck would have it, I missed a turn and found myself in a rural part of town with no cell reception. I was getting ready to turn back when I spotted a sign for Buena Loma Farms. I was intrigued by what I might find so I followed the signs to a small stand on the side of the road. Actually, it was the home of Charlie and Elvie Colabella. Immediately, Charlie came out to greet us and had us sampling fruit. We had the sweetest oranges and the most delicious grapefruit, apples and blood oranges. We also tried sweet Gloria Gold limes which Elvie called 'magic' lemons. I think she called them magic because they looked like lemons but actually had a mild taste without the tartness of a regular lemon. Charlie and his wife, Elvie eagerly gave us a tour of the gardens. We saw the many varieties of fruits and vegetables that were growing on the farm. The kids were also allowed to help Charlie pick blackberries, while I hand selected kale straight from the garden. Charlie and Elvie developed the land over 16 years ago and just one month ago started selling to the public. 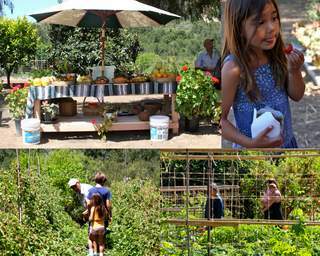 All their fruits and vegetables are organically grown, using a homemade fertilizer and are hand cultivated. Charlie has a special interest in educating the public on home gardening and composting. We eventually made it to the Santa Margarita Trail, but the best part of the day was discovering Buena Loma Gardens, meeting Charlie and Elvie and tasting some wonderful produce. If you visit in the next few weeks you will be treated to eggplants, peppers, tomatoes, melons, Italian heirloom squash (known as Marianna Di Chioggia), kabocha squash, apples, persian mulberries and figs. Personally, I’ll be back in about a week for the Persian mulberries. Since my last visit, Elvie has created a picnic seating area for visitors to sit and enjoy the serenity of the gardens. Visitors are also welcome to bring their own picnic lunches. When you stop in be sure to tell Charlie and Elvie that you learned about them through Conveying Awareness. This helps them know that their efforts at networking are reaching many. Thank you! Update on 7/6/12: I, Jessica with Conveying Awareness, visited Buena Loma Gardens on the 4th of July and I will be blogging about my experience and some recipes that Elvie shared with me that I made the days following my visit.